•RivEX can generate a grid over your network and sample a fixed number of points per grid cell. This is stratified sampling. Such output could feed into further river analysis or compliment a survey strategy. 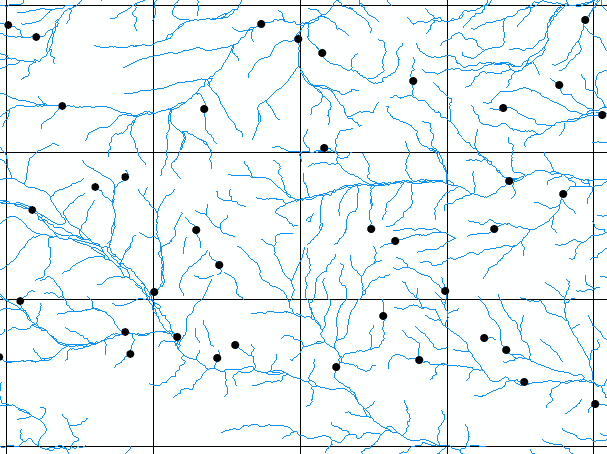 •The generated grid is based upon the extent of the river network layer. The maximum X and Y values of the grid extent are rounded up to fit the user specified cell size. This ensures all parts of the network intersect the grid. •You have a variety of options that can influence (bias) the selection process and it is important that you understand these. Click here to review these options. Avoid sampling same location and nodes are ticked on as default. 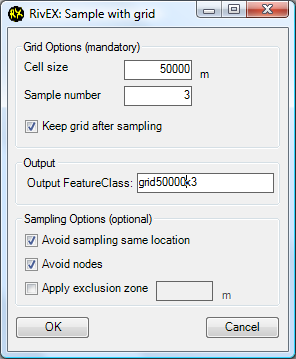 •Set the cell size in meters and enter the number of times you want to sample within each grid cell. * = The Count field is the number of sampling points generated in the cell, if this is less than what you requested then RivEX was unable to sample that part of the network the required number of times. For example you may have specified an exclusion zone that stopped RivEX sampling a fragment of network that fell within the grid cell.